The Great Lakes’ coasts are often depicted as sugar-sand beaches sloping into gin-clear water, but Jessica Sherman has seen a less glamorous side of what can happen where the water meets the land. While playing her part in a five-year effort to asses the quality of coastal wetlands across the Great Lakes basin, Sherman has slogged through shoreline areas that are less sand and more swamp. But it’s not always so bad. Sherman is a wetland technician with the Institute for Great Lakes Research at Central Michigan University. 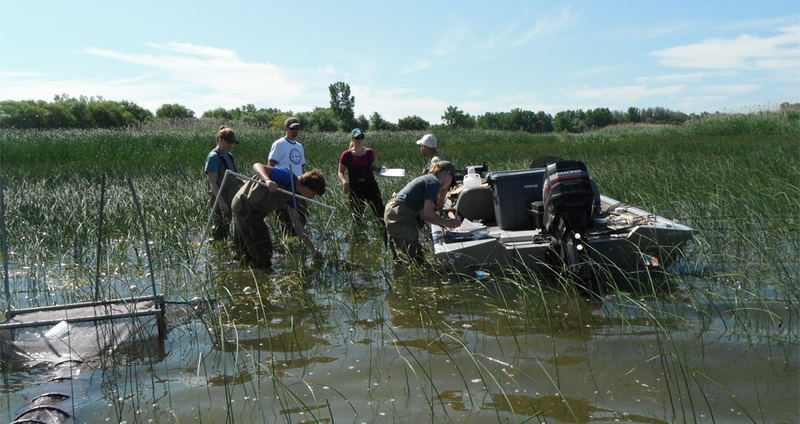 The school is at the center of a five-year, basin-wide wetland monitoring project funded by a $10 million grant from the U.S. Environmental Protection Agency grant under the Great Lakes Restoration Initiative. The project builds on the the work of past initiatives like the Great Lakes Coastal Wetlands Consortium. That seven-year project, which concluded in 2008, emphasized the importance of coastal wetlands to the Great Lakes environment and economy and established monitoring protocols to collect standardized wetlands data across all the lakes. Now that monitoring is underway, and the resulting data could help target restoration resources to the habitats that are the most degraded, and conservation resources to the pristine environments that need protection. Data collection and analysis is still underway, but the information will ultimately be made publicly available. Crews from around a dozen universities and agencies are gearing up for the third year of data collection. Researchers at Central Michigan University oversee the entire project, and crews from the school are responsible for assessing wetlands along the Michigan Great Lakes coast. The monitoring includes assessments of fish, birds, amphibians, vegetation, invertebrates and water quality. The water quality assessments include visiting a wetland once a year for five years, collecting water samples for lab analysis and spot sampling with YSI data sondes for parameters like pH, turbidity and dissolved oxygen. “It’s kind of a snapshot of what that wetland was like the day that we were visiting it,” Sherman said. Collaborators include the University of Notre Dame, Grand Valley State University, University of Minnesota Duluth, University of Wisconsin-Green Bay, University of Wisconsin-River Falls, Lake Superior State University, University of Windsor, SUNY Brockport and Oregon State University. The Michigan Department of Environmental Quality, Environment Canada and Bird Studies Canada are also participating. The size and scope of the binational monitoring effort reflects the importance of coastal wetlands to the Great Lakes ecosystem.